I’ve been taking aerial silks (also called aerial fabrics) for over a year and a half now, and I’ve learned just how important clothing choice is for a good day at class. For the most part, dressing for aerial class is much like dressing for yoga: you want to wear something comfortable and flexible. That said, there are a few extra considerations to keep in mind. You’re going to be flipping upside-down and tying yourself up in the fabric. Loose pants are difficult to work with, and billowy shirts will flip up over your head. Form-fitting is best because it will stay out of your way. The only embellishment on your clothes should be seams and prints. Mesh is ok, too. Avoid any kind of zipper or other decoration that could snag on the fabric. Simple leggings are usually your best bet. I’ve worn my fair share of tanks and sleeveless tops, but most of the time, covering my armpits is ideal. Some tricks will get the fabric right under your arms, leading to some serious friction. Fabric burns under your arms do not feel good, friends. I prefer long sleeves when possible, but during the summer months, short sleeves do just fine, too. As a bonus, covering your underarms also means you won’t smear your deodorant or perspiration all over the fabric, which helps them stay cleaner for longer. Your classmates will thank you for keeping the fabric fresh and stank-free. When you’re first starting out, the fabric on your pants might not make a difference. But once you start to do things like wraps and knee climbs, slippery fabrics will become your arch nemesis. Instead, look for fabrics that have a more cottony feel that aren’t too slick. Once you get really good and your technique is locked down, this won’t matter as much. In the meantime, a little help from your pants can make all the difference in helping you get comfortable. I’ve noticed that wrapping yourself up in fabric has a way of tugging on your pants. This can lead to some awkward moments if your pants don’t have a lot of coverage. Anytime I’ve worn lower-rise bottoms, I’ve regretted it. I recommend sticking with mid- or high-rise styles. The best bottoms aren’t just longer in rise, they’re also longer in length. I prefer 3/4, 7/8, or full length bottoms. Basically, I want something that reaches past the widest part of my calf muscle. Crops that just barely go past the knee usually don’t work as well, and I never wear shorts. I admit I haven’t tried one myself yet, but this is a popular choice I see around my studio. Leotards or bodysuits layered under or over a pair of leggings provides extra coverage and won’t move as much as a tee. Something like this Zella bodysuit or this one from lululemon look promising. With all of the above in mind, here are the specific styles from my closet that I reach for the most when I’m getting ready for class. Alo high waist moto leggings. Since these are made of a cotton-like fabric, they grip very well. The high rise version provides plenty of coverage, and the styling adds something interesting without zipper or other snag-prone elements. Koral mystic capris. These are one of my favorite all-purpose basics, and they work great for aerial. When I can’t figure out what to wear, I frequently reach for these. Lululemon luon wunder unders. Basic, but that’s exactly why they work so well! Lululemon aligns. These are a godsend during summer. They’re long enough to cover everything that needs to be covered, light enough to keep me cool, and grippy enough so I don’t slide right out of the silks. Lululemon swiftly LS. The great thing about these tops is that they’re perfect for both running and silks–one of the few styles in my closet that works for both! They’re fitted and lightweight, but still cover everything I need. I reach for one of my swiftlies almost every week. Sweaty Betty glisten LS. I love this top for similar reasons that I love lulu’s swiftlies. It’s a little thicker and warmer, which is nice for colder days in the studio. The fabric is very stretchy, which means I can push my sleeves back more easily when I need. I find that this top holds onto my tights well, which means it moves around less and stays down more easily than a swiftly. The only downside is that the fabric tends to show a bit of wash wear. Any textured bottoms. Jacquard knit prints are SUPER grippy. Basically, if it has a textured, almost denim-like feel, it will grip a hundred times better than something that’s so slick (like lululemon luxtreme) it doesn’t feel like a knit at all. I own the cropped version of these and they are some of my absolute best pants for silks class. i do silks sometimes and i agree w/ longer bottoms! i wear longer bottoms for yoga too because i find the material down my leg helps me hold certain poses w/ a bit more traction. one thing i avoid for both yoga and silks is lux/fullux/nulux. so slippery. i cant. luon is my fave. Weighing in with advice for other apparatus. Most of what you wrote would apply for lyra and static trapeze, but covering your armpits is not as important. However, the backless bodysuit you posted that is very cute would be a no go for lyra and trapeze. With your back coming into contact with the lyra or bar (balances, spins, etc. ), you want a barrier over the skin. I also wear a pair of snug thigh high leg warmers over my leggings when training lyra for an added layer of cushion. The legwarmers also have “heel holes” so that they can cover the tops of my feet but I don’t recommend that for novices. Thanks for sharing your extra tips! That makes total sense about backless tops for lyra and trapeze. Those surfaces can be a bit rougher on the skin than silks so I can imagine extra protection is needed! Yes, completely agree on slippery fabrics! They worked when I was first starting out, but now I’ve pretty much abandoned them completely. Just doesn’t work! Totally unrelated, but what is the style name of that blush Lululemon tank is in the upper left corner? The one being worn over a Free To Be Serene bra and burgundy Wunder Unders. I love it! I checked the site but didn’t see it. I found it on the UK site (though not in blush): https://www.lululemon.co.uk/p/women-tanks/Turn-Around-Tank/_/prod11080213?rcnt=3&N=7t5&cnt=21&color=LW1BC6S_028390 It looks like it might be called either the turn around tank or the twist it tank (I noticed the URL and page title are different). I’m not sure if it’s been released in US/Canada–I couldn’t find mention of it anywhere except the UK site. 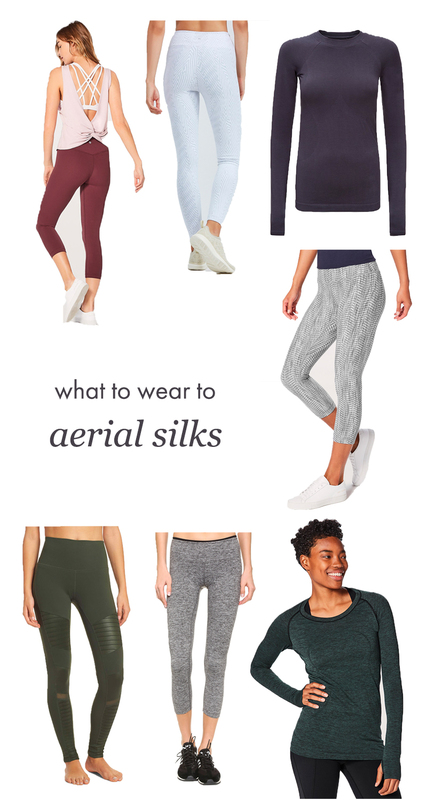 These would all definitely apply to an aerial yoga class that has a hammock style silk instead of two super long, free-hanging silks like your class. If anyone is a super beginner and wants to ease into aerial silks, try aerial yoga first! The hammock style provides more support and focuses less on hand knots and the like at first. Aerial silks (unbeknownst to me at my first class) is a whole ‘nutha ballgame … and I have an added huge admiration for the body strength of people who do circus activities. Holy moly. It’s like gymnastics but in the air. So cool, so hard, and every person I’ve met that does it is so happy to have anyone at any skill level in their class because they have so much fun. Thanks for chiming in for aerial yoga–all that makes total sense. :) I agree that the aerial community insofar as I’ve been a part of it is always so welcoming. It’s a little bit gymnastics, a little bit dance, and a little bit like the game of Twister, haha. totally off topic but you’ve written a bit about how activewear trends are going mad lately and i just saw a crushed velvet combo from beyond yoga and it’s honestly gloriously unreasonable. i’m laughing aloud, and i can’t tell if it’s because it’s so silly and ridiculous or if it’s because i’m like “heck yes do your silly ridiculous thing.” maybe both. 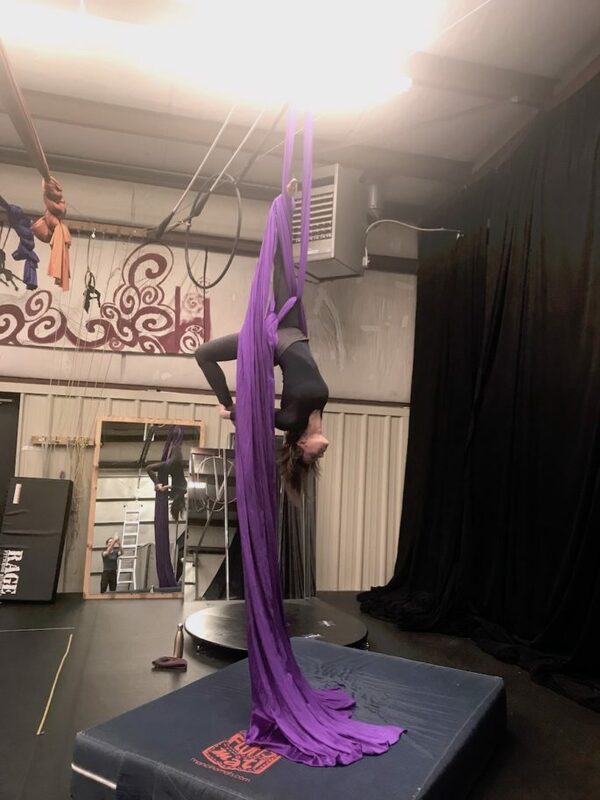 Aerialetics is a new aerial training line that is made just for silks and sling and the padding/fabric behind the knee is great for chains too. I heard hey are coming out with a more padded line for lyra and chains. A couple girls were wearing them in a training course I took and they loved that they didnt have to worry about their clothes in the silks. And they looked amazing in them! Crying because I take pole dance classes here! You make me feel so proud to live in Flagstaff. I started to use Stick-E gloves and my performance bolted up 50%. I am planning to include the Stick-E socks in my practice. Wish someone would design a to with a bit of support for the back of the neck. I wear a zip up snug fleece jacket but it gets a bit warm.